Sewerage and water infrastructure and other utility services represent a significant investment on the part of most municipalities. For well over 100 years, the distribution networks for utility services have been located underground in pipes or ducts that are laid, repaired or replaced by trenching from surface. In cities and urban areas, these distribution networks are located underneath the roads. This often makes access difficult, particularly in areas congested with traffic and buildings. When pipeline infrastructure is not well maintained, inefficiencies occur. For example, in water distribution system, this can lead to leakage and possible water shortages. In sewage system, cracked and damaged pipes can cause wastewater seepage, leading to contamination of ground water apart from other host of problems. These problems often give rise to related health and environmental impacts and are needed to be corrected at an early age. 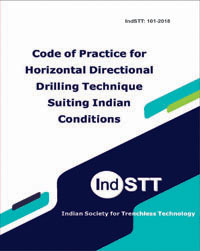 Horizontal Directional Drilling (HDD) is a steerable technique for the installation of pipes, conduits, and cables in an arc shape using a surface launched drilling rig. This method requires the execution of a pilot bore which is then enlarged with the use of a reamer prior to installation of the product pipe. Depending on the diameter of the product pipe, multiple enlargements may be required. The excavation is performed by the mechanical action of a fluid assisted cutting head. Stipulating conditions for equipment de-commissioning. As HDD provides a cost effective alternative for developing subsurface pipelines in the Trenchless way this code of Practice is expected to provide a useful benchmark for the user. Like all codes this code is also expected to grow with time and the Society invites the readers/users to provide their inputs to include additional issues to make the code more useful.